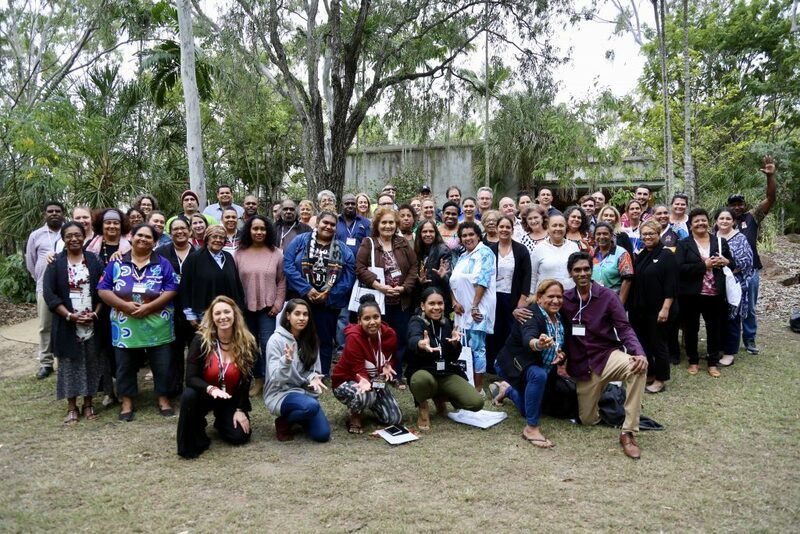 Binbi Wadjabay Attendees, Rockhampton 2018. A full summary can be downloaded here as a PDF. Queensland Indigenous Languages Advisory Committee together with Department of Aboriginal and Torres Strait Islander Partnerships (DATSIP) were pleased to coordinate Binbi Wadyabay: Queensland Aboriginal and Torres Strait Islander Languages Forum on the 16th and 17th of May 2018 at the Dreamtime Cultural Centre, Rockhampton. The forum was hosted by Darumbal Enterprises in Rockhampton and supported by the Indigenous Languages and the Arts Program from the Dept. of Communications and the Arts and First Languages Australia. It was an inspiring, energetic and fun event attended by over a hundred people. The forum opened with a beautiful welcome to country by local Darumbal Elder Nyah Nyoka Hatfield followed by a message from the Deputy Premier of Queensland the Hon. Jackie Trad. A highlight of the morning were traditional dances by the Warrior Descendants. Day one of the forum saw community members taking part in workshops and presentations that related to the successful delivery of language programs, with day two providing the opportunity for community members from across Queensland to have input into the discussions with DATSIP on developing a state language policy. There was an overwhelmingly positive response to the two day program and keen interest in continuing involvement. Below is a summary of the program. 2M Language Services and the National Accreditation Authority for Translators and Interpreters (NAATI) presented on the need for accredited language speakers for translating and interpreting. This is an essential service across many areas of the government, including justice, health and education. of Indigenous languages, including published vocabularies and original materials such as diaries, wordlists and other language data collected from historical sources. This hands-on workshop was a fantastic hit; participants learnt to cook a traditional meal with a twist, the instructions were entirely in language. The presenter and participants had to use body language and facial expressions to communicate, with the session demonstrating the effectiveness of language immersion to learn a language. The pronunciation workshop gave participants a deeper understanding of the sounds that make up our languages. Participants examined where in the mouth the sounds are made and how to hold your tongue for each sound. The International Phonetic Alphabet was discussed as a useful tool for improving the pronunciation of our languages. Personal reflections from Yarrabah’s short five-year journey and ideas to learn/teach language sounds were shared to encourage attendees to continue their own important work. This presentation described the different aspects of Aboriginal and Torres Strait Islander grammar in a simple and easy- to-understand way. It looked at the origins of our first languages, the free word order, prefix and suffix, and sounds & symbols of Aboriginal and Torres Strait Islander languages. First Languages Australia gave an overview of a selection of national projects, in particular Gambay: Interactive digital languages map, the Priority Languages Support Project, the National Indigenous Languages Collections Strategy, and Nintiringanyi: National Aboriginal and Torres Strait Islander Language Teaching and Employment Strategy. RNLD operates across the country and offers a wide range of resources and training to support the documentation and revitalisation of Australia’s first languages. This session provided a summary of the organisation’s work, the training programs on offer and their plans for the future. This workshop held in the beautiful outdoor area of the Dreamtime cultural centre focused on healing through language and art. It was an uplifting experience for the audience. The digital classroom is a pilot program run with Central Queensland Language Centre and Tannum Sands High School. The program is run via Adobe connect, with students using headsets with a speaker and microphone to join in. The lessons are based on the language of the land and touch on cultural aspects of the language. Since 2013, the ABC and First Languages Australia have been working together to deliver national projects for language communities across Australia. The presentation showcased a number of these projects, including broadcasting station IDs in Indigenous languages, the Mother Tongue project, This Place, the national place names project, The Indigenous Languages Song Competition, Marrin Gamu, and the new Aboriginal language “through the window” segments for Play School. The collaboration also enabled the ABC to be available on both days of the conference to collect language stories for broadcast. First Languages Australia and the ABC used the opportunity to capture a range of language stories for broadcast into the future, including ABC Station ID’s, Language Legend videos, Word Up stories and interviews. First Languages Australia supported five young champions to attend and present at the forum. The young champions gave a short presentation on their connection to language, their language aspirations and what they feel is the importance of reviving their languages. The presentations were an inspiration to all. The focus of this presentation was to promote the work of communities fundraising for their language projects. Annalee presented ideas and examples of the many different ways to fundraise and described the planning needed to successfully raise funds for language activities. the song in two or three languages. After the session the groups came back together to perform the songs to the larger group. The Our Land Song workshop was a beautiful wrap up to the first day of the forum with all participants relaxed and enjoying the opportunity and challenge of learning to sing in another Queensland language. The second day of the program began with presentations and facilitated discussions around the key areas of government that are active in supporting Indigenous Languages. An introduction to the State Library’s Aboriginal and Torres Strait Islander Languages Strategy. * Raise broader community awareness & appreciation. This presentation focused on schools implementing a traditional language program and advice on how the Department of Education can support teachers and school leaders to align their language programs to the Australian Curriculum. * What advice should we be giving to principals around community engagement? * How can language centres and community organisations best engage with schools? This facilitated group discussion examined how languages can play a role in the work of Queensland’s Department of Justice. A case study looking at examples of using language in tourism. Rory O’Connor from the Yugambeh Museum talked about working with major tourism partners, such as Dreamworld and the Commonwealth Games, to embed language in their major attractions. endeavours across the Lake Eyre Basin Indigenous Land and Sea Ranger Program. and Torres Strait Islander health and wellbeing and explored how they must be acknowledged and addressed to improve health outcomes for Indigenous Queenslanders. Following the presentations, DATSIP facilitated discussions towards a Queensland Indigenous Language Policy. * What are the key Queensland language policy issues (defining the problem to be addressed by a policy)? * What should be the vision and guiding principles to drive policy development & outcomes? * What are we going to do (develop policy, strategies, initiatives, by partnering with community and all levels of government)? * How will we do it – policy development process, co-design and engagement, strategies, and actions (short, medium and long term)? * What will success look like for community and government? E.g. improved community wellbeing through strong connection to community and culture, languages are being preserved and maintained, improved public sector cultural capability and better service delivery, improved social and economic participation outcomes? Each group then presented a summary of their discussions with key points identified. DATSIP will collate the results and draft a consultation paper to support community engagement and co-design steps.